How would one describe the Ace Hotel In Palm Springs, CA? “Different” might be a start. “Cool,” “fun,” and “hip” also come to mind. It’s certainly a destination in and of itself, not just a place to hole up for a night while visiting the rest of Palm Springs. Music is the starting point. The pool is the center of attention at the Ace Hotel In Palm Springs – and on the weekends there are poolside DJ’s playing tunes all day long. Hanging out at the pool we listened to the latest electronic and indie rock faves while enjoying the 80 degree weather (and it’s the middle of winter!). Rock and roll fills the hallways and lobbies, and some of the rooms have turntables where guests can go old school and listen to vinyl! The album library in our room was not huge, but did include Motley Crue, Elton John, Johnny Cash, Eric B. and Rakim, and Eazy-E. Besides the music, there are other treats as well. The hotel is actually an old motel that has been renovated. It’s modern, but also includes a hodge podge of antiques and a wonderful southwestern motif. The bar has an extensive bloodymary menu and mouth-watering organic nibbles. 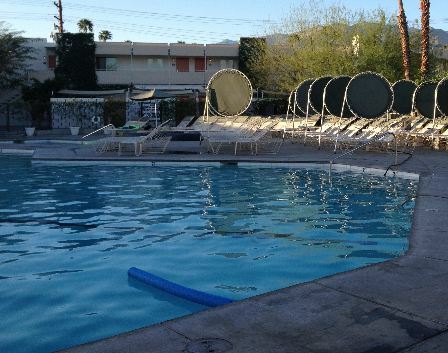 Location wise, the Ace Hotel is just a few minutes off of the main strip of downtown Palm Springs. Downtown is within walking distance, but we opted to take a cab to head to dinner one night. It’s close to the national park, Joshua Tree and The Salton Sea. Palm Springs is housing an iconic 26 ft. statue of Marilyn Monroe sculpted by Seward Johnson. Another fun tourist attraction is the Palm Springs Aerial Tramway, which is the largest rotating aerial tramway in the world. While the hotel does cater to a young, hip, high energy and sometimes loud clientele, it is still family and kid friendly. There is a separate pool away from the crowds and loud music at the main pool. I saw many small toddlers around the pool and on the grounds. 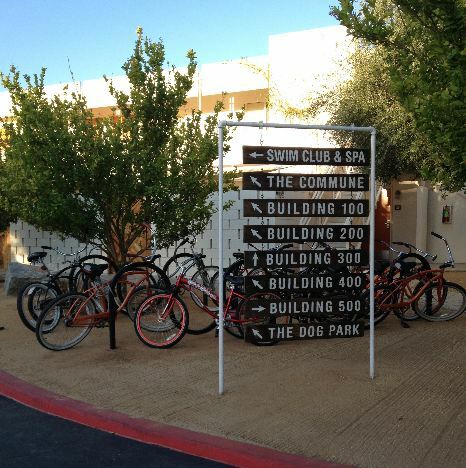 Ace Hotel also offers bike and scooter rentals. As for customer service – it was great during our stay. The front desk gave me quite a few suggestions as to what the resort offers, such as the stargazing deck, nightlife every night, and dog park. Yes – a dog park! The Ace Hotel is one of the few hotels that is actually very pet friendly. The price seems very reasonable for such a unique place. An average standard room with no patio can run as low as $99, depending on their summer or off-season specials. I opted for a dog friendly patio room, although similar rooms are offered with a fireplace. The rooms have modern bathroom sinks and showers, and are fully stocked with high quality bath products and soaps. There are events going on every single night in the bar, the Amigo Room or poolside, I opted to chill out fireside with friends near our hotel rooms on vintage couches, ordering late night cocktails under the millions of stars in the desert sky. What an experience! 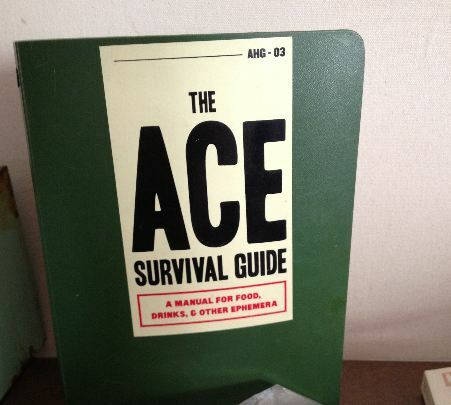 Overall, I really loved staying at the Ace Hotel. A few photos are posted below. Have you been there? Share what you thought of the Ace Hotel In Palm Springs in the comments section below!